Predictions are like advanced weather reports. It depends on how you live and who you are wether the weather will effect you. For example, King Philip of Belgium had his progressed Sun inconjunct Saturn. He enjoys his Xmas holiday, while there is criticism because of the way of transport (a military plane) in times of reductions on the military budget (this in times of world wide tension...). 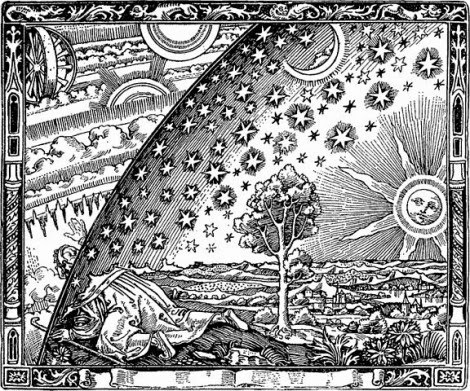 Predicting the future is like in that picture above: trying to have a look into another world, that of 2015. It is simply an astrological weather report and sometimes there isn't much that you can do to stop the rain from falling. However, an umbrella helps a bit. I don't do sun sign predictions. But I do have a message for those who are born on certain days. It is about Uranus-Pluto and tension. Those who may need strong nerves are born between January 3 and 7, April 2 and 7, July 4 and 9 or October 6 and 11. They are not alone. If your birthday + number of years happens to be one of these data, you might also have to deal with a tense year. If your natal or progressed Ascendant or Midheaven or midpoint Sun/Moon is in the 13-17th degree of the Capital signs, you may also be looking forward to unexpected problems and changes. Don't be afraid, because if you take care for yourself and your safety and if Uranus-Pluto is not important in your natal chart, it won't effect you in person. Let me tell you about the good news of 2015. Sagittarius born between December 4 and 22 has a beautiful aspect to look forward to: Juputer trine natal Sun. I was born on December 12 and if I am righ, I will enjoy this on 19/20 January and June 21 2015. Positive things come with Jupiter. I hope it is true. Saturn will make you alert if you were born between November 20 and December 3. With a birthday between August 21 and September 4, you could be confronted with mistakes, debts and limitations somehow or have to say goodbye to a situation or person. This might also be the case for persons with any point in the chart between 29 of the fixed signs and 12 of the movable signs. Venus in 2015 moves from the final degrees of Capricorn to the first of Sagittarius. This doesn't mean that Sagittarians won't have any fun next year. That is because there are more positions than the Sun in your chart, because there is a progressed Sun in Capricorn or Aquarius and because there are trines. Venus' trines will hit my natal Sun 3 times and there are 21 moments of fun as far as I know, without counting my birthday, Xmas and my progressed birthday (I celebrate my birthday + number of years = number of days:). Read about the many happy moments in a year..They are like lit candles in the darkness. Venus is for fun and seldom symbolize big changes when she passes bye as Transit Venus. But she is great for a visit to the hair dresser or to meet nice people. As people are not signs and signs are not people, and as a person born on your birthday won't have your life (or death), it is clear that there is more than an astrological weather message to get a full picture of your situation and feelings in 2015. You need a birth time and place to make a chart. But you also need to know your condition and situation (age, gender, social position, country, genes). We are complicated and so is the world. It helps to make the world better, because it would help to change the meaning of transits like those of Saturn. In the Middle Ages, if you were at the wrong place and time, you could loose your head with Saturn on MC and as it happens, so it is in certain parts of the world today. Change that and Saturn's symbol will change so that it just means that your position makes you worry (a bit) about responsibilities, guilt, mortgages or people's criticism. Let's support all those who try to keep and make the world a place to love. Wish you a wonderful start of 2015! This morning I visited Cova do Urso, blog of Portugese astrologer António Rosa, whom I met in Lisbon during a workshop with Noel Tyl. I was shocked to read that he passed away. António was a very kind and versatile astrologer. He will be missed. I am so sad to have to tell you this. Winter solstice's chart is for 23:03 GMT this year (http://www.timeanddate.com/calendar/december-solstice.html) and for December 22, 0:03 in The Netherlands. The chart of that moment shows the Moon rising before the Sun (almost New Moon) and Jupiter as well as Saturn without major aspects within a 5 degree orb. Every year in December/January there is a conjunction of the Moon with the Sun in the astrological sign Capricorn. This year it is in the first degree of Capricorn. For those with the first degree of Capricorn, the New Moon is more important than to the rest of us. With this degree in the 10th house, they may expect changes in their public position, for example. When you were born on December 22/23, March 21/22, June 21/22 or September 23/24, the New Moon is in tight aspect with your natal Sun. This is your chance to find out if that really means change starting within a month. That is also true for those who have a 0-1 degree Capricorn, Cancer, Libra or Aries on the horizon (Ascendant-Descendant) or meridian (IC-MC) in the natal or progressed chart. In the 'Beeldgids van de dierenriem' (Helene and Willem A. Koppejan) there is a picture explained by Janduz of a couple holding hands but looking the other way. Another Sabian Symbol is that of a native American chief demanding power. The combination of this points at common or joined responsibilities to be the focus of the month to come. If your chart is being 'charged' by the New Moon, you are maybe about to experience changes in the field of responsibilities at work or at home. And if these changes happen to you, you know that New Moon worked for you:). Most people simply want to know if their Xmas party will be fun. A third of them will check their sun sign to find out beforehand. The positions of Venus, Jupiter and midpoint Venus/Jupiter are the position of fun and joy and party time. During the days between Xmas and New Year those with Sun, Venus, Moon, Ascendant or MC in the 22nd (21-22) degree of a fire sign (Aries, Leo, Sagittarius) are blessed with Jupiter in Leo Retrograde. This will help them to look back being happy even though there might be a less pleasant person who almost spoiled all the fun. If you were born on or around April 13, August 13 or December 13, this might happen to you. A pleasant and loving Xmas is for those with a happy Venus related to their charts. Birthdays between May 8 and 18, September 10 and 20, January 8 and 18 are the lucky birthdays of this year. There is also fun around for those with any position in natal or progressed chart between the 18th and 27th degree of the earth signs Taurus, Virgo or Capricorn. Check your chart! The day after Xmas Venus will be inconjunct Jupiter to remind us of 'too big, too many, too much'. Your weight might understand this:). If your birthday is around end of October/beginnings of November or between January 25 and 31, the midpoint Venus/Jupiter will be on your natal Sun to make you feel happy with Father Xmas. Of course, your individual charts and personal (or national) circumstances could keep you away from having a party. Xmas is a community celebration and it is a fact that not everybody will be able to join in. But, even if there is just a little bit of light on the horizon, try to be happy about the fact that this celebration has been worldwide for ages because it is the celebration of light and the sun growing. For those in a nasty period the come back of the sun with more light might help them see that there is hope, even in dark hours. That is what Xmas is about. Here is the Xmas chart of Rotterdam. Every place on earth has it's own Xmas chart. Jupiter is trine Ixion, trine Pholus and trine Eris now. This triangle will be back again in 2015. As little study has been done about the dwarf planet Eris and the asteroids Ixion and Pholus, only time will tell what this trine will mirror. Eris is the symbol of disharmony, Ixion is the symbol of the 'bad guys', Pholus is the man who shot himself. Jupiter expands and helps (even our enemies). Trines are symbols of getting away with it and finding easy ways out. Lucky adjustments to be able to deal with nasty guys? Well, to get back to Xmas: maybe this Jupiter helps those with family problems:). I'll be on the look out for what happens during this trine. HAVE A WARM, PEACEFUL AND NICE DECEMBER PARTY TIME! Uranus rises before his Sun and is 'calling' (not aspected)! This VIP Uranus is a sign of being a rebel, being different, somehow, or wanting to make changes and in fact: he is a 'different' person willing to make changes. There is an important place for the Moon conjunct Galactic Centre, on the Descendant and inconjunct Pluto. Moon inconjunct Pluto is an important aspect in his chart, as both the Moon and Pluto don't make any aspect in orb 5 degree except for the quincunx between them. The aspect refers to submissive (see: http://astropost.blogspot.nl/2009/04/effect-of-moon-inconjunct-pluto.html ) and forced behavior. The intensity of habits make it difficult to change, even for a leader (Sun without aspects is 'calling' for attention and the starring role) and even for a revolutionary person when it is about systems and the 'people'. In a way, it is a problem to have a Moon-Pluto in conjunction, because you have problems with adjusting. The Moon is Out of Bounds and that points at a key role for emotions, habits, popularity. Mercury and Venus are also OOB. With Moon and Uranus as the most important objects (Moon on DC and calling, Uranus rising before Sun and calling) with Sun and Pluto as second best, this chart is the chart of an unusual very devoted and strict rebel who is a leading authority. Sun/Moon midpoint in Pisces explains the reigning need for belief systems and ideologies, even more because this midpoint is opposition Neptune. He is being motivated by ideals and a true believer. A special aspect is Venus in Cancer trine Saturn. Isn't that a perfect symbol of the love of simplicity and economy? But what to do with Venus/Pluto midpoint square Midheaven? Money is strongly related to his status, but in a different way than usual because of his ideals. People adore him for his simple and unusual way of live. The midpoint Jupiter/Neptune on the IC tells us about the fans and followers of Mujica. 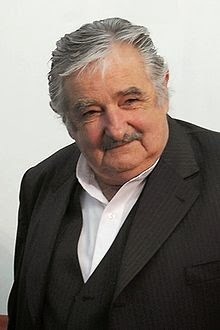 José Mujica sure shows how to make the best of difficult aspects:).